While Sambal Belacan Kangkong is a popular vegetable dish in Singapore and Malaysia, this Kangkong with fermented bean curd is pretty common in Hong Kong. As you know, I am a die hard fan of Hong Kong (and its food! ), I will not miss eating and cooking some of these signature Hong Kong household dishes by my own. If you like Kangkong, but already bored with Sambal Belacan or plain garlic stir fry, try this now. Simple, fuss-free. 1) Heat oil in wok over medium-high heat. Add garlic (and chili, if opt for), and stir fry till fragrant. 2) Add fermented bean curd. Lightly mash in the wok. Add Kangkong, stir fry to combine and cook till soften. 3) Sprinkle salt and sugar. Stir fry for another 1 min before heat off. Dish up and serve. A serving of my Kangkong dish counts less than 150kcal. I’m sending it to a few buddies ans additionally sharing in delicious. And of course, thank you for your sweat! I have time I will be back to read a lot more, Please do keep up the superb work. 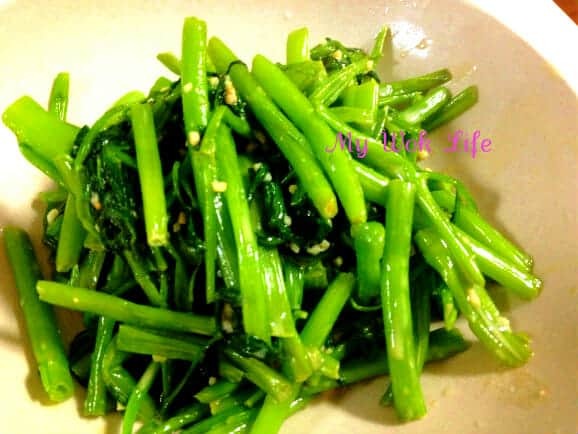 Is there any brand of Fermented beancurd that you could recommend for frying kangkong?